Giveaway: Win a Blu-ray Copy of Avengers: Infinity War! The superhero event of the summer is finally arriving on a television screen near you. 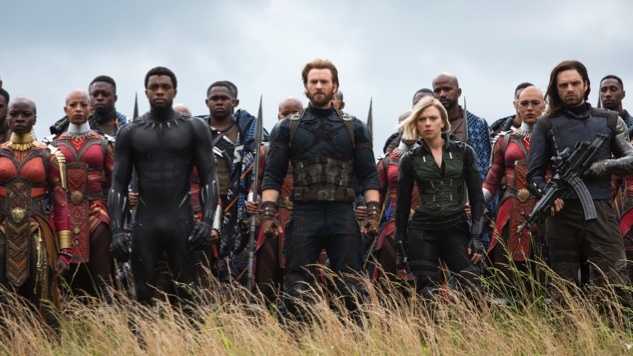 Avengers: Infinity War marks the Marvel Cinematic Universe’s 19th film. It’s also the Avengers’ most challenging battle to date, as the team takes on the Mad Titan Thanos and oppose him in his quest to gather all six Infinity Stones. With the Blu-ray release arriving on Aug. 14, we thought that we would celebrate with a giveaway! We are giving away copies of the Infinity War Blu-ray to five lucky winners. See for yourself why Infinity War changes the MCU forever by entering for the chance to win. Entries open starting today, Aug. 6, and the deadline to enter is on Monday, Aug. 13 at 11:59 p.m. ET. The giveaway is open to U.S. and Canadian residents only. Enter to win your copy right here! - Strange Alchemy (5:08) – Share the thrill of characters from across the MCU meeting for the first time—and discover why some were teamed up together. - The Mad Titan (6:34) – Explore the MCU’s biggest, baddest villain, his trail of influence through the stories, and the existential threat he represents. - Beyond the Battle: Titan (9:36) – Dive into the climactic struggle on Thanos’ ruined world, including the epic stunts and VFX, to uncover the source of its power. - Beyond the Battle: Wakanda (10:58) – Go behind the scenes to find out how the filmmakers pulled off the most massive and challenging battle Marvel had ever attempted. - Hunt for the Mind Stone (1:24) – On a darkened street, Wanda Maximoff and the wounded Vision attempt to hide from Thanos’ brutal allies. - A Father’s Choice (4:00) – Thanos confronts Gamora with a vision from her past—and with lying to him about the Soul Stone. Gag Reel (2:05) Watch your favorite Super Heroes make super gaffes in this lighthearted collection of on-set antics. - Audio Commentary (approx. 149 min.) by Anthony and Joe Russo, Christopher Markus and Stephen McFeely. Infinity War is the culmination of the MCU’s first ten years, which began with 2008’s Iron Man. Bringing together heroes from almost every Marvel film, the film depicts the Avengers’ uphill battle against Thanos and his army as they invade Earth and attempt to collect the last remaining Infinity Stones. At Paste, we emphasized the dire stakes and losses of this ambitious film in our review. Again, you can own the climactic piece of the Avengers’ journey and their last stand to save the universe by entering from now until the Aug. 14 midnight deadline. Watch the trailer for the Blu-ray release of this superhero epic below.